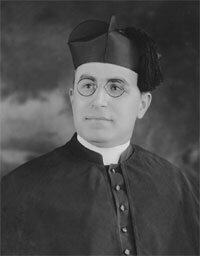 Father Nowicki was appointed pastor of St. Florian on March 18, 1922. Upon arriving, Fr. Nowicki immediately recognized the need for a larger church and school for the growing parish. After securing the necessary land, a new school/church complex was started. According to Ripley’s Believe it or Not., at the time of its construction, it was Catholic Church built in the United States to have a street level entry way. The church/school complex featured a ground level church with the school on the upper level. The building was dedicated on November 22, 1927 and continues to serve as the church and school for the parish today. Father Nowicki also led the parish during its 25th anniversary. Fr. Nowick left St. Florian in 1934 for another parish. He passed away on September 6, 1955.